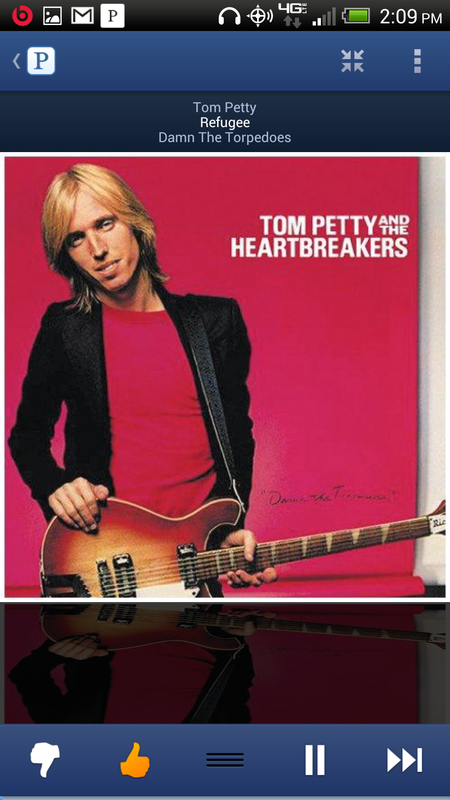 I've been using Pandora for a while now. I honestly don't remember when I started - maybe around early 2008. The web client has been a standby for me, even as the ads have grown more frequent, intrusive, and lengthy. I don't really mind. But since picking up my first Android phone, a Nexus One, back in 2010, I've never been too fond of the official app. Sure, it works, but the speed, stability, and reliability of streaming have never been particularly good, despite numerous major updates. 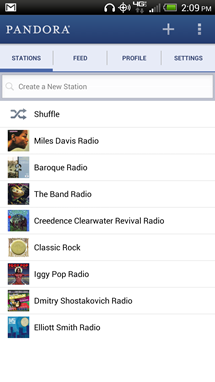 Tonight, Pandora released Pandora v4.0 for Android. Previously, it was v1.7. So, wait a minute - how do you go from 1.7 to 4.0? That doesn't make any sense. Well, actually, it almost sort of does, if you listen to Pandora's logic. 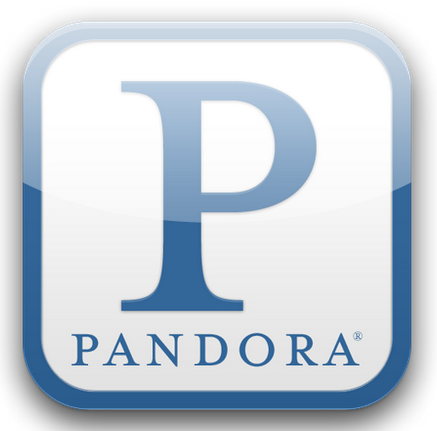 The iOS version of Pandora is currently at 4.0, and with this release, Pandora claims the Android app is finally good enough to match its iOS sibling. Visually, this looks pretty much like the old app, though there's a lot more going on in terms of features. And actually, I do like the design, it's functional and puts the information you want in your face pretty obviously. It even uses the modern software menu button implementation. Unfortunately, one major flaw should already be dead obvious in the screenshot on the far right: no notification bar (or lockscreen) controls. That's a serious bummer for any music app, and one that I find very hard to overlook. Anyway, what exactly puts this new version on par with the iOS one? Well, there's a lot more stuff you can do, basically. 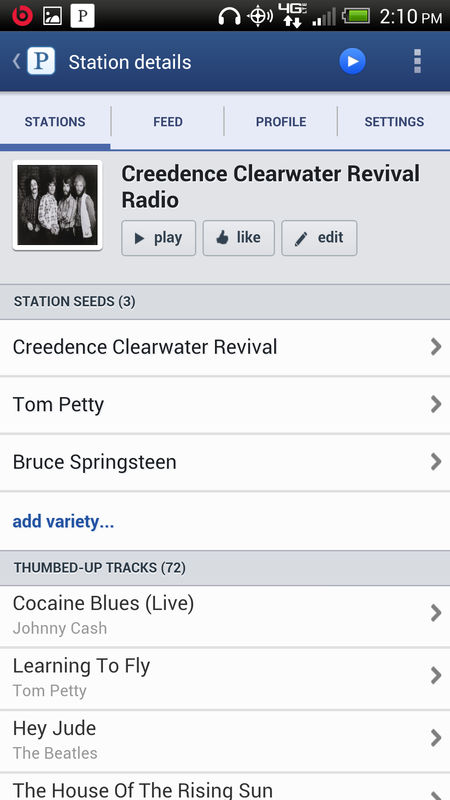 First, Pandora's integrated their whole social thingy, so you can share songs and stations and see what your Pandora buddies are up to. 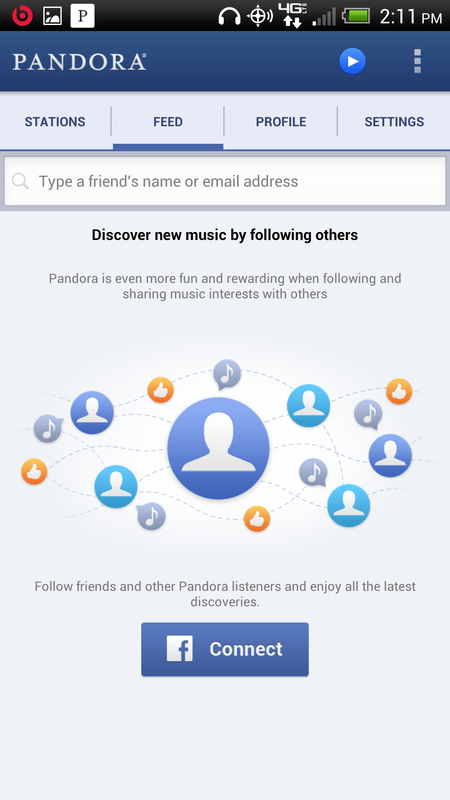 I really haven't had much time to delve into it, but it does seem kind of cool, if your friends use Pandora. It's also 100% opt-in, so Pandora isn't forcing you to use it or anything. There are a load of new options for dealing with your stations, too. In the old version of the app, you were pretty much limited to deleting and creating them. 4.0 lets you share stations, rename them, and view a detailed page about each one. The aforementioned page shows you the tracks you've thumbed-up / thumbed-down for that station, the seed artists you put in to create it, and comments on that station by your friends. 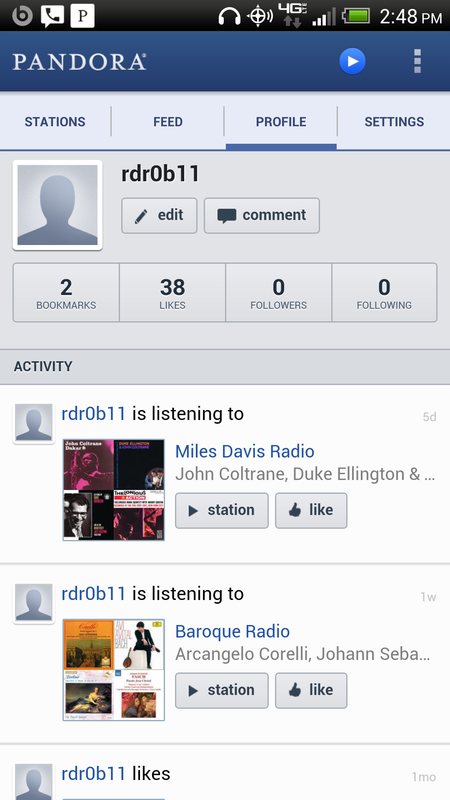 You can also add a station description, as well add variety to stations on the fly. 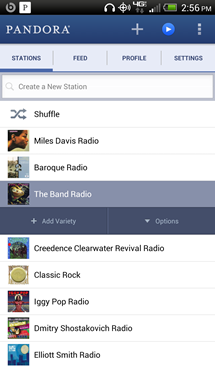 There's no denying the added utility here - Pandora has definitely upped its feature-set for Android, and that puts it back in the running as one of the best music streaming services on the platform. But there are some issues. The lack of notification bar or lockscreen controls aside, Pandora still is missing some key elements of a proper music player, streaming or otherwise. Other than a barely-visible blue progress bar, there is no indication how long a given track is. That's just always struck me as weird, personally. The fact that you have to pull up the lower bar in the player to adjust volume isn't so bad in and of itself, but it's made annoying by the difficulty in the whole "actually pulling it up" sense; I often have to grab it two or three times before I'm successful. The app generally doesn't feel very quick, either - the double-tap gesture that takes you to a list of your recently played tracks on a station stutters along, artist bio and song info pages scroll lethargically even on my quad-core S4-packing, Jelly Bean-running DROID DNA review unit. Text and content in a lot of these secondary areas also isn't exactly formatted prettily, while the main screen - the station list area - is gorgeous. The net result of these effects? As a user, the app feels just a little lazily hashed together to me. Some performance optimizations and rearranging could go a long way. 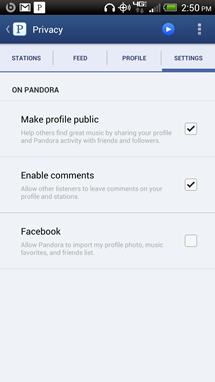 Speaking of performance, Pandora claims stability and playback have been improved generally, and I'm mostly inclined to agree. 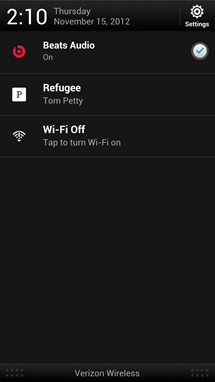 I only had the app lock up on a song switch once, and skipping to a new track alleviated the issue. Otherwise, I've not had any pauses, crashes, or random skips, and that's using the app over mediocre LTE signal, not Wi-Fi. But what about audio quality? 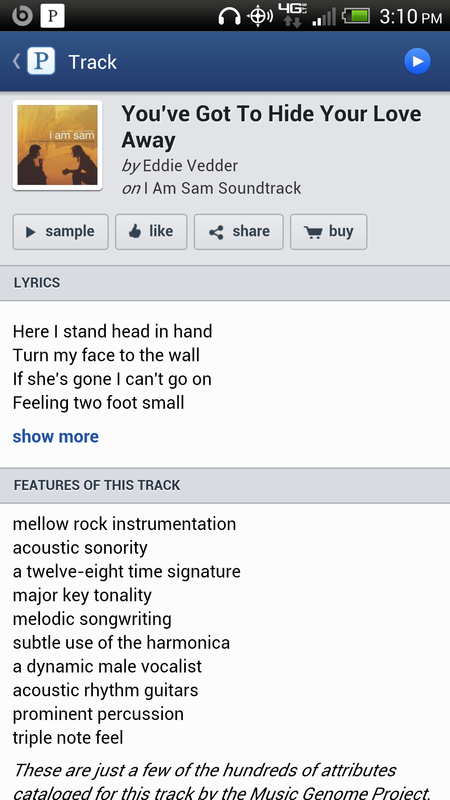 Well, Pandora's mobile app still fails to impress me in the area of fidelity. 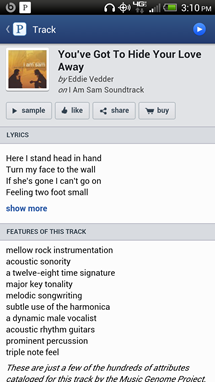 Why can I stream 192Kbps audio with Pandora One on the desktop, but only a maximum of 64Kbps AAC over mobile, regardless of account type or connection (yes, that is the "Higher Quality Audio" setting)? This is downright silly. Modern high-end smartphones have excellent digital-to-analog conversion, generally, and ever-more robust headphone amplifiers. Is 192Kbps just out of the question? Don't get me wrong, 64Kbps AAC doesn't sound bad (roughly equivalent to 128Kbps MP3), but it's a little bit annoying knowing I could be getting a noticeably better experience if Pandora would lift its utterly arbitrary restriction here. Pandora's new app is undoubtedly better than its old one, and it's great to see the Android release hit feature-parity with iOS, but it still needs work. 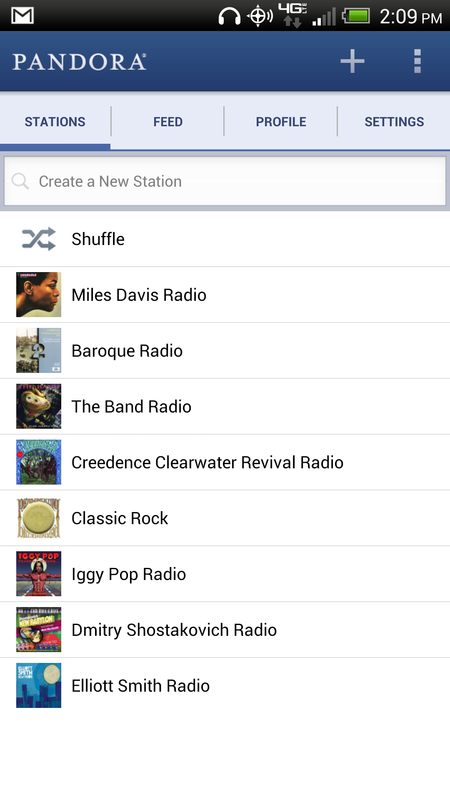 More speed, more attention to presentation, and more control for users all need to be on the Pandora dev team's "list." Regardless, I'm glad to see Pandora taking Android seriously, and things can only get better from here (I hope). Hit up the Play Store to grab the new app now.